The cavaquinho (pronounced [kɐvɐˈkiɲu] in Portuguese) is a small string instrument of the European guitar family with four wire or gut strings. A cavaquinho player is called a cavaquista. The most common tuning is D-G-B-D (from lower to higher pitches); other tunings include D-A-B-E (Portuguese ancient tuning, made popular by Júlio Pereira) and G-G-B-D and A-A-C#-E. Guitarists often use D-G-B-E tuning to emulate the highest four strings of the guitar (also the same tuning as the baritone ukulele). The G-C-E-A tuning is sometimes used to emulate the soprano/tenor ukulele, an instrument developed from the braguinha and rajão, brought to Hawaii by Portuguese immigrants, from Madeira Island, in the late 19th century. The origins of this Portuguese instrument are not easily found. Gonçalo Sampaio, who explains the survival of Minho region’s archaic and Hellenistic modes by possible Greek influences on the ancient Gallaeci of the region, stresses the link between this instrument and historical Hellenistic tetrachords. The author holds that the cavaquinho and the guitar may have been brought to Braga by the Biscayans. 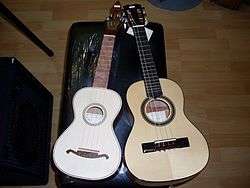 There are different kinds of cavaquinho. The minhoto cavaquinho, associated with the Minho region in Portugal, has the neck on the same level as the body, and the sound hole is usually in the raia format (raia is Portuguese for batoidea); it is more akin to the viola braguesa. The Brazilian cavaquinho, associated with Brazil, like the cavaquinhos associated with Lisbon and Madeira, differs from the minhoto in that its neck is elevated in relation to the body, and the sound hole is traditionally round; thus it is more akin to the classical guitar. It is a very important instrument in Brazilian music, especially for samba and choro. The standard tuning in Brazil is D-G-B-D (although D-G-B-E and the mandolin tuning G-D-A-E are also used for soloing). Some of the most important players and composers of the instrument's Brazilian incarnation are: Waldir Azevedo, Henrique Cazes, Paulinho da Viola, Luciana Rabello, Alceu Maia, Mauro Diniz and Paulinho Soares. The samba cavaco is the connection between the rhythm and harmony sections, playing the rhythm comping. It is played with a pick, with sophisticated percussive strumming beats. The cavaquinho is also found in other places. In Cape Verde the cavaquinho was introduced in the thirties from Brazil. 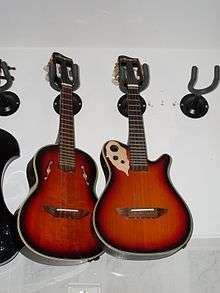 The present-day Cape-Verdean cavaquinho is very similar to the Brazilian one in dimensions and tuning. It is generally used as a rhythmic instrument in Cape-Verdean music genres (such as morna, coladeira, mazurka) but it is occasionally used as a melodic instrument. In the United States (especially Hawaii), it was introduced by Portuguese and became an important part of the popular music of that place. The Hawaiian Islands have an instrument very similar to the cavaquinho, called the ukulele, which is based on the machête or braguinha (variation on the cavaquinho), brought to the islands by Portuguese immigrants. The Hawaiian ukulele also has four strings, though tuned differently (usually G-C-E-A), and a shape somewhat similar to the cavaquinho. The machête was introduced into Hawaii by Augusto Dias, Manuel Nunes, and João Fernandes in 1879. Richards, Tobe A. (2008). The Cavaquinho Chord Bible: DGBD Standard Tuning 1,728 Chords. United Kingdom: Cabot Books. ISBN 978-1-906207-09-0. — A comprehensive chord dictionary instructional guide for the Brazilian and Portuguese cavaquinho.